Forward K.K. 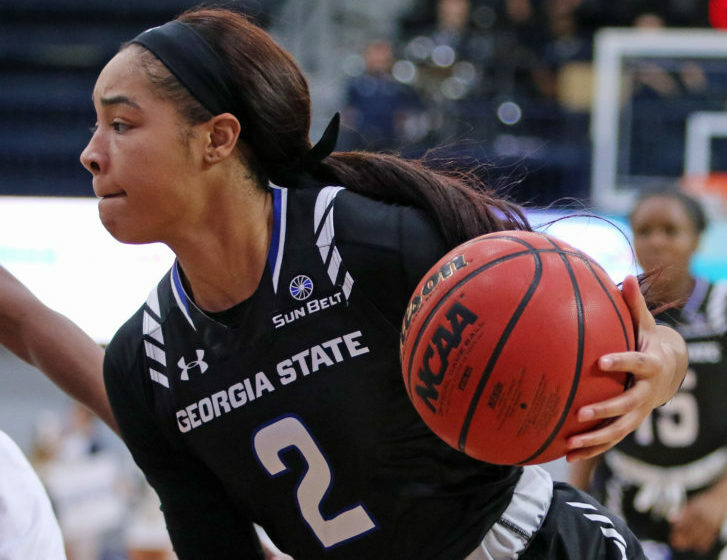 Williams led the Panthers in points in a rival game against Georgia Southern on Feb. 3 Photo courtesy of Daniel Wilson | GSU Athletics. Georgia State women’s basketball picked up a huge 83-66 win over Georgia Southern that puts them over .500 in the Sun Belt Conference. The Panthers (11-9, 6-4) cruised to its sixth straight over Georgia Southern in a hostile Hanner Fieldhouse. Last season, the Panthers swept the season series against the Eagles and picked up where they left off on Saturday. The team shot the ball well, 60 percent from the field and 57 percent from three. The Panthers made 12 3-pointers, tying the school record. They also shot a 60.4 field goal percentage which is the fifth best in school history. Senior forwards K.K. Williams and Allison Johnson lead the team in scoring. Williams had a game-high 22 points and made 6-of-8 3-point attempts. Johnson finished with 21 points, seven rebounds and six assists. The Panthers came out hot, making their first five attempts from 3-point territory. They took an early 11-4 lead and didn’t let up. After the 8:10 mark in the first quarter, the Panthers never trailed again. The Eagles shot only 35.7 percent from the field and 23.1 percent from three-point. They went into the half down 47-25. They were smothered on offense and didn’t defend well against 3-point shot in the first half. Williams finished the half with 17 points and made 4-of-6 three-pointers. The Eagles fought back in the second half, but the Panthers persisted. Early in the fourth quarter, the Eagles trimmed the deficit down to as low as 13 points, but it still wasn’t enough. Midway through the fourth, the Panthers went on a 6-0 run and held the Eagles to just four points the rest of the way. The Eagles finished the contest shooting 40.3 percent from the field and 33.3 percent on 3-pointers. Both teams had a high number of turnovers, 19 for Panthers and 17 for Eagles. Three Eagles finished with double digit points and one player had a double-double. Hailey Dias-Allen had 16 points and 12 rebounds, Alexis Brown had 15 points and Nakol Franks also had 15 points. This rivalry victory gives Georgia State the same conference record as Appalachian State with nine games remaining for each team. They both are firmly in the conference tournament race. Georgia Southern falls to 1-9 in conference play and 6-14 overall. They are last in conference standings and have a very low chance of making it to the conference tournament. The Panthers have a few days off until their next game, which will be at home on Feb. 7 against Louisiana-Monroe.